"You are ready for war," observed Toturi. Again, the Crane only nodded. "The Emperor forbids war between the Great Clans." Tensions between the Great Clans of Rokugan are on the rise! The Toshi Ranbo season of the Kotei series for Legend of the Five Rings: The Card Game is now well underway, and we've already seen a number of samurai earn the honored title of Hatamoto for their performances at PAX South in San Antonio and WarpCon in Cork. We've seen deft political maneuvering and astonishing displays of military prowess. And yet… the fate of Toshi Ranbo remains undecided. 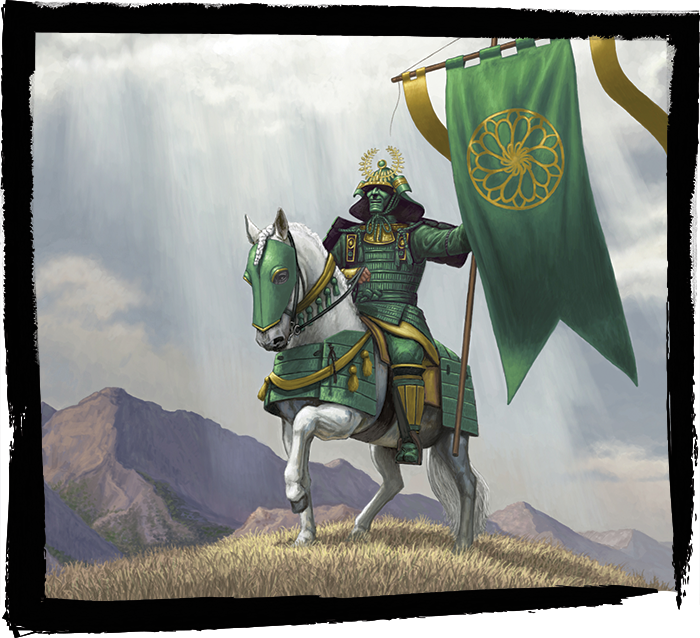 A focal point for the tensions between the Crane and the Lion—and between the Lion and the Unicorn—Toshi Ranbo is a strategic military location for the whole of northern Rokugan, and your participation in the season's Kotei can help steer the city's fate. But it's not just the Crane, the Lion, and the Unicorn who have a vested interest in the city. As illustrated by today's new work of fiction, Lisa Farrell's The Specters of War (pdf, 664 KB), each and every one of the Great Clans has an interest in Toshi Ranbo. In The Specters of War, Lisa Farrell pursues the tensions surrounding Toshi Ranbo from the perspective of Akodo Toturi, the newly appointed Emerald Champion. These tensions are nothing new to Toturi, as he has already fought the Crane—and witnessed his brother's death—on the plains outside the city. Nonetheless, Toturi's marriage to Isawa Kaede has led him to understand there is more at stake than the military brinkmanship between the Lion, Crane, and Unicorn Clans. Kaede's dreams have been haunted by the restless spirits she claims walk through the fields outside Toshi Ranbo, searching for something unknown. Meanwhile, there are rumors of new veins of jade—rumors certain to draw the attentions of the Crab. The Crab want to take advantage of the jade mine recently located nearby, which would go a long way toward replenishing their depleted supplies needed to fight the Shadowlands. The Crane claim the city is theirs because they’ve held it off and on for centuries. Moreover, the Crane know the city grants them their greatest foothold in the north and losing it would leave them strategically open on their northern flank. The Dragon are mysterious as ever, but their descent from the mountaintops indicates an unspoken interest. With the tensions between the Great Clans on the rise, the Dragon might want to eliminate any chance of a rival clan claiming a stronghold so close to their territory. The Lion, as Toturi knows, claim Toshi Ranbo as part of their ancestral territory, and even while Toturi hopes to move toward peaceful resolution, he knows that his brother's death outside the city has motivated others among the Lion to see the city's reclamation as a means of honoring their fallen champion. The Phoenix wish to learn why restless spirits are haunting the battlefield, and have petitioned the Emperor for oversight of the city to give them the time they need. The Scorpion assuredly view the city as the key to tipping power away from the Lion and the Crane… though they would never openly claim anything except their hope to rule the city "on behalf of the Emperor." The Unicorn, like the Crane, are inching dangerously close to war with the Lion, and they want to use the city against the Lion—to forge an alliance with the Crane and to establish a flanking base. As Emerald Champion, however, Toturi finds himself viewing the matter differently. He is no longer simply the Lion Clan Champion; he is now a servant of all Rokugan, and he hopes to use his role in order to forestall the eruption of war. But Toturi is still just one man. Even the office of Emerald Champion is limited in its influence, and there are plenty others acting to advance their own causes. You can be one of these individuals. Throughout the Toshi Ranbo season, you can earn Glory Points at any Kotei or Grand Kotei that you attend. These points are earned through advancing to the final rounds of the Kotei and Grand Kotei tournaments, and when a clan performs honorably overall. 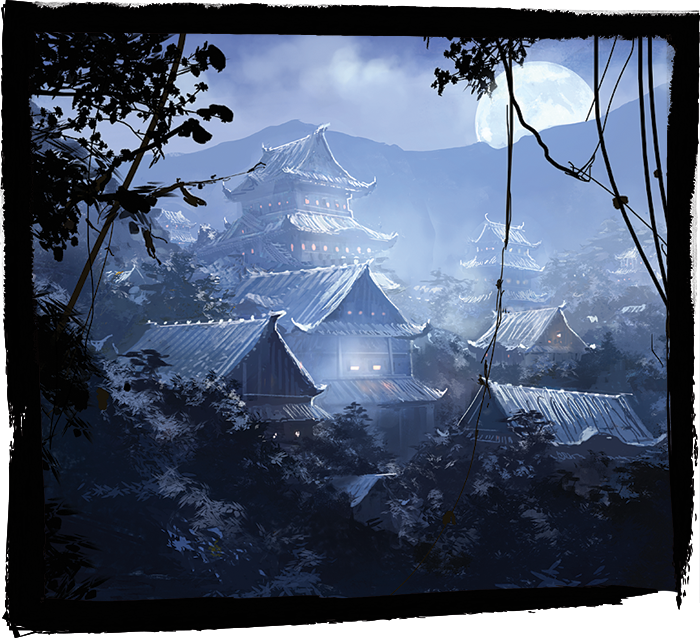 At the end of the season, the most glorious clan will earn the Toshi Ranbo season's most important prize: a new card granting them control of the season's namesake city! The Toshi Ranbo season is now fully underway. The year's first Grand Kotei is scheduled from March 9th to March 11th in Paris. Then, we will launch into a string of battles that are bound to reshape the conflicts of Rokugan. Who will claim Toshi Ranbo? Read The Specters of War (pdf, 664 KB) to review all that's at stake. 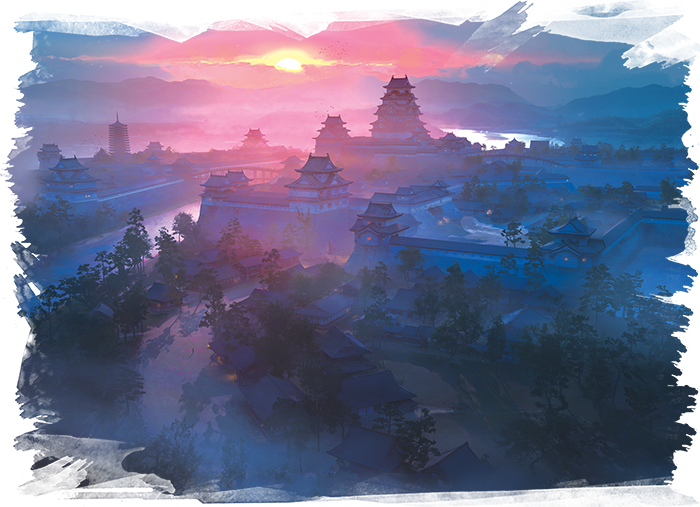 Then, make your plans to attend one of our Kotei series events for Legend of the Five Rings: The Card Game so that you can do your part in seizing the northern stronghold for your clan!